BIGFLIX is a free Windows 8 movies app that lets to watch full blockbuster movies anytime right on your Windows 8 device. Along with watching full movies, you can also watch just the trailers of latest upcoming movies, stream videos of your favorite movie without logon to any website. Yupp…you heard it right, the popular BIGFLIX website where you have been watching almost all the upcoming movies is now available as a Windows 8 app. Now, as you open this movies app for Windows 8, you will be displayed with number of blockbuster movies links. At the top of the screen is a filtration for selecting a movie easily — one is for choosing a language such as English, Hindi, Gujarati, Malayalam, etc. in which you want to watch a movie while the other one is choosing the type of movie you prefer watching such as Action, Animation, Comedy, Romantic and the like. You can also watch music videos of popular songs. Just click on “Music Videos” given in the form of tile on the main page of the app. So far so good…here comes the turning point. The app id free to download, however, you need to subscribe with BIGFLIX in order to watch full movie. Yupp…you read it correct. You can take a trial and watch a selected movie for 10mins to test the clarity of video and the quality of the sound played. After that, you need to pay INR249 per month to continue with the app. Now, to subscribe, just click the right muse button anywhere on the screen, click on “Account” option given in the context menu. Click on “Subscribe” option. Once you subscribe with the app, the benefit does not end with watching full movies. You can also create a personalized playlists where you can add your favorite movies to watch anytime. In addition, you can also view history of the movies you have just watched. 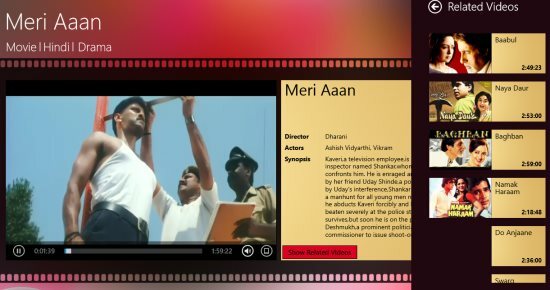 As you click on a movie to watch, you will be displayed with an “Show Related Videos” option. Clicking on this will bring you a list of the related movies. In short, BIGFLIX Windows 8 movies app is a nice entertaining and relaxing app for Windows 8 where you can relax you mind when feeling stressed. Go ahead and create your own blockbuster theatre right at your desktop. Download BIGFLIX app available under the entertainment category of Windows 8.